Setting up field references for content types declared using XML requires that the unique field identifier is known ahead of time. When creating field references in code, you only need to supply the associated field name. SharePoint retrieves the identifier automatically. For example, the following code segment creates a Project Proposal content type based on the built-in Document type, and then adds an Author column to the new content type. The Author column is provided by SharePoint as one of the built-in site columns available in the Document Columns group. With XML content type definitions, the fields are declared statically at design time. Once the content type is deployed and provisioned, its fields cannot be changed without rewriting the solution. On the other hand, by using the object model, you can setup the content type differently depending on external conditions. This way you can build smarter solutions that adjust automatically to accommodate changes in the runtime environment. When working with the Windows SharePoint Services 3.0 object model, it is useful to create a set of helper components to simplify solution development. This can greatly reduce the steps needed to build a solution because the low-level details of working with the object model are tucked away inside higher level abstractions that are easier to declare and use. This is especially important when building document management solutions based on content types because you ultimately want to encapsulate the business rules within the content type itself. Having a library of core components means you don't have to start from scratch each time you need a new content type. Listing 1 shows a generic ContentType class that is used as a wrapper for the underlying SPContentType object instance. /// A utility class for manipulating SharePoint content types. /// Creates a wrapper for an existing content type instance. /// Adds a content type to a SharePoint list. /// Removes a content type from a SharePoint list. /// Loads a pre-existing content type. /// Creates a new content type. || baseTypeName.Length == 0) ? /// Conversion operator to access the underlying SPContentType instance. /// Adds a new field having a specified name and type. /// Adds a new field based on an existing field in the parent web. With this helper class in the component library, it's easy to declare a new project proposal content type. It can be instantiated either from an XML definition associated with a feature, or it can be created entirely in code. Listing 2 shows the declaration for the project proposal type derived from our generic content type wrapper class. /// A helper class that encapsulates the ProjectProposal content type. /// Creates the type using the XML content type definition. /// Creates the type using the SharePoint object model. // Call the base method to create the new type. // Create the fields programmatically. This code produces the content type definition shown in Figure 3. In order to use the content type in a SharePoint site, you must deploy the type definition and then attach it to a list or document library for which content types have been enabled. Before you can achieve this, you need an additional piece of helper code to setup the document library to hold the proposal documents. Listing 3 shows a ProposalLibrary class created for this purpose. When creating the document library, you remove the default Document content type so that users cannot create or upload standard documents. Finally, you create a new instance of the ProjectProposal content type and add it to the document library using the AddToList static method of the ContentType helper class. /// A class that represents the proposals document library. // Initialize the base library properties. // Remove the default "Document" content type. // Add the custom proposal content type. The easiest way to deploy a new content type is to include it as part of a custom feature. 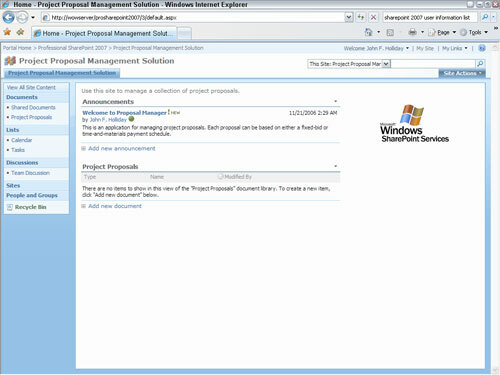 Here, you create a ProposalManagement feature to enable all of the proposal management tools on a site. As part of the feature implementation, you create an SPFeatureReceiver class for the FeatureActivated event that handles the deployment details for our custom content types. Listing 4 illustrates this process. // default list view to the left web part zone. /// Creates a ListViewWebPart on the main page. // Access the default page of the web. // Get the web part collection for the page. // Add a list view to the bottom of the zone. Now you have a site definition that includes the ProposalManager feature. 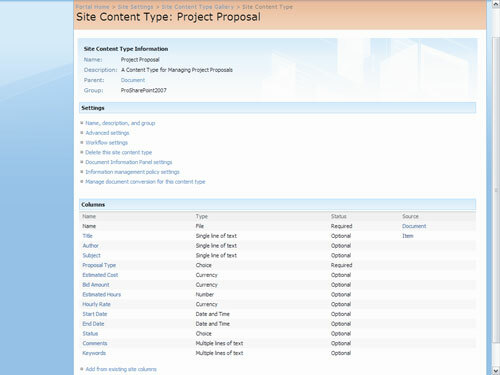 When a site is created based on this site definition, the FeatureActivated event receiver creates a document library called Project Proposals that is automatically associated with our Project Proposal content type. Figure 4 shows the home page of a site created from the site definition. This article is a pre-publication excerpt from Chapter 11, "Building Document Management Solutions," of Professional SharePoint 2007 Development (Wrox, 2007, ISBN: 978-0-470-11756-9), by John Holliday, John Alexander, Jeff Julian, Eli Robillard, Brendon Schwartz, Matt Ranlett, J. Dan Attis, Adam Buenz, and Tom Rizzo. John Holliday is an independent consultant and Microsoft MVP for Office SharePoint Server and has over 25 years of professional software development and consulting experience. John has been involved in a broad spectrum of commercial software development projects ranging from retail products to enterprise information systems for the Fortune 100. His expertise includes all aspects of distributed systems development, with a special emphasis on document automation, collaboration and enterprise content management. In addition to his professional career, John is actively engaged in humanitarian activities through Works of Wonder International, a non-profit he co-founded with his wife Alice, and the Art of Living Foundation, an international service organization devoted to uplifting human values throughout the world.